There are currently 3,465 users on this website. I've had these for several years. They are Mint, but I elected not to pay the premium for Never Hinged. As I mentioned elsewhere, I rarely look at the back of my stamps anyway, so I decided to save a few dollars. Centering is less than perfect on my examples and I believe on this series as a whole. I know there are forgeries of this series. These came from a reputable collector; he and I both believe them to be authentic, but I have no certs to prove it. Very nice. I don't often see a complete set. As for myself, I have 3 or 4 of each series...nowhere near the complete set. I don't have complete sets either. The ones I do have are used. Very very nice looking set. Like others here, I have 2 or 3 of them. A nice set to own. I don't have a complete set either but I'm sure its somewhere on my list! I read somewhere that the experiment with the overprints was considered a failure. Thank goodness, or we would have 48 sets of 11 stamps each. It would be an expensive nightmare. So very true! Figure 57 cents per State x 48 states = $27.36 face value, which was quite a sum back in the pre-Depression era. 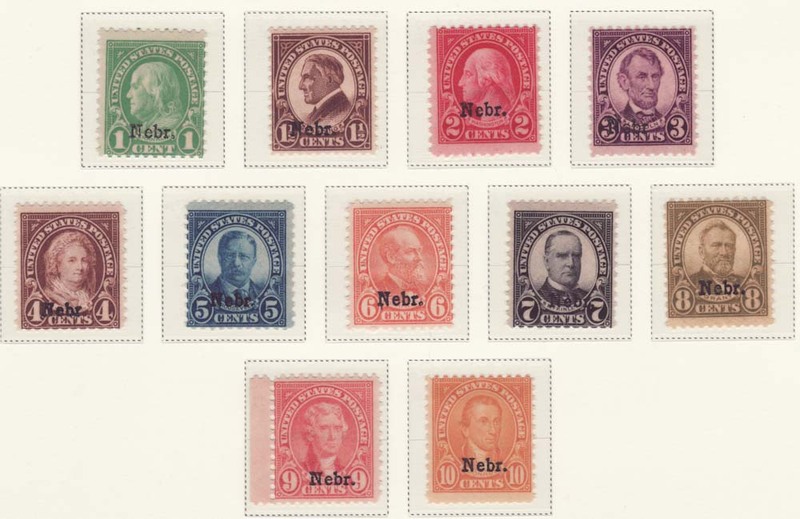 A series of post office robberies in the Midwest was the stated reason for the creation of the 1929 Kansas and Nebraska overprinted stamps of the Fourth Bureau Issue. 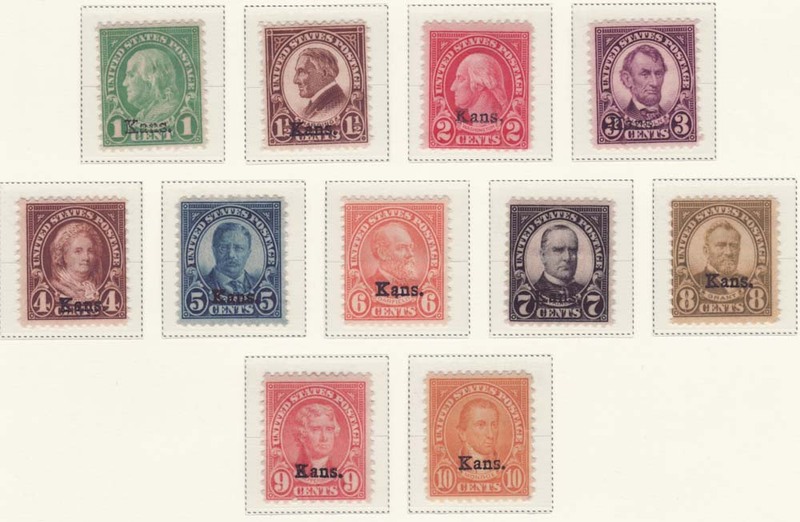 The Post Office Department conceived the idea to overprint stamps with the abbreviated names of the individual states, believing that stolen overprinted state stamps would be difficult to fence in or out of state. Kansas and Nebraska were selected to initiate the experiment. Since security at large city post offices was considered adequate, only small post offices would receive the stamps. A one year supply of the 1-cent through 10-cent stamps was overprinted for Kansas and Nebraska. Higher values were not included because they were not printed by rotary press and could not easily be overprinted. The overprinted stamps could only be sold at post offices within their respective states, but they were valid for postage throughout the United States and wherever U.S regular stamps could be used. Shipments of the stamps began on April 15, 1929. Economics rather than theft actually played the pivotal roll in promoting the state stamp idea. Kansas and Nebraska postmasters were required to requisition a one-year supply of the overprinted stamps, not the normal quarterly supply requisition. Had the experiment succeeded, the Post Office Department planned to extend the scheme to all forty-eight states, hoping to cut fulfillment costs by 75 percent. There was considerable confusion as postal clerks nationwide misunderstood the rules and tried to assess postage to replace entirely legal usage of the Kansas-Nebraska stamps. The Department decided to abandon any further consideration of state overprinted stamps on March 29, 1930. WT1 -- thanks for the Riverside link -- VERY good information. wt1, thanks for that link. I have full sets of Kan/Nebr overprints, now I will see and hope they are real. Have had them for years and can't remember where I got them from. Will post what I find out in a few days. I learned that most of the fakes were done with a typewriter and easily spotted by flipping them over and looking for the indentations made by the typewriter as the originals were done differently (I forget how but I know it didn't leave the "dents") Now I know this info to be old and with the introduction of the laser printer and a crafty hand could probably produce a convincing copy but I thought it was worth noting anyway? I love your pictured stamps too! I am getting a 404 not found error on that link. Oops never mind, I did not see the new link. I don't own any of these! I REALLY GOT TO WORK ON THOSE PAGES SOON! It took 0.98 seconds to lick this stamp.